I thought it would be fun to reach out to the museum regarding this, and this is the reply I received. I'm copying their reply here with permission, and thank you Daisy Museum Staff! I'll try later to post the picture they sent. In the early 1970 a series of wood guns were made and among them was the 846. The shroud itself is off of a model 846 toy gun made in the early 1970s. The scope is a #301 toy gun scope with no glass for magnification - but it should have an eyepiece. I've attached a catalog page scan from a 1974 catalog. Take a look at the model 846 Training rifle (toy gun). That is the shroud that is shown with the scope attached in Daisy Talk / on ebay. There was not a production shroud made with a scope mount. There are two options regarding how this piece came to exist - and they are really the same. It's possible that a shroud was pulled before it was painted and the scope mount was spot welded to it by a Daisy employee as a speculative new product idea. No doubt it was rejected either due to cost or because it would have required larger packaging and therefore more retail space. This gun was never produced with the scope/mount. It's also possible that any other individual might have created the piece for the same reasons. Too cool. A true skunkwerks type deal here, unique to the hilt. I finally got the picture they provided loaded. The gun in question is the lower left one. I couldn't find any other pictures of that one anywhere! 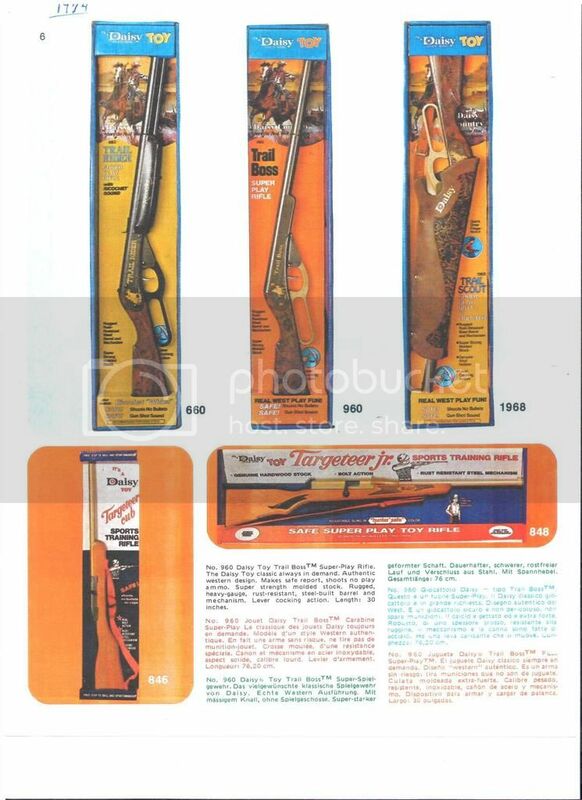 Veering off the subject a little, I have the scabbard for the 1968 Trail Scout on the upper right photo. No belt/strap. just the scabbard. Until now I didn't know what it was for. Thanks for posting the pix.